In 1938, the Rossika Society was only nine years old, and its centers of gravity were in Yugoslavia (its birthplace) and the Baltic States. Yet a group of emigres, none of them wealthy, came together to host a Russian philatelic exhibition at the New York YMCA, the first of its kind in the United States. Held on 10 April 1938 (as close to the Society's 14 April birthday as was possible), it was organized by one of the giants of Russian philately in the West, Sergey Vasil'evich Prigara. It is thought that the 1938 vignette was also Prigara's work, but we cannot be certain. The vignettes were printed in sheets of 10, perforation 12, with five stamps inverted, thus producing a possibility of three tete-beche pairs per sheet. It would be 19 years before Rossica issued another vignette. 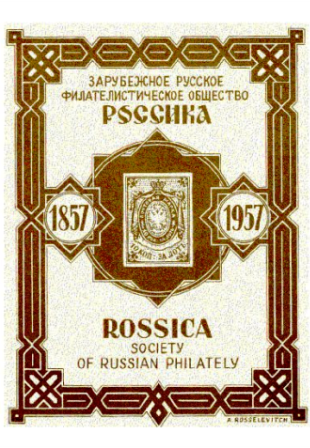 Designed by A.M. Rosselevich, an accomplished draftsman, and printed by Rostislav Polchaninoff, the 1957 souvenir sheet was sold at Rossica's combined annual meeting with the British Society of Russian Philately at the Hotel Vanderbilt in New York on 24 November. Rossica unveiled it's last vignette in 2007 at Chicagopex 2008 honoring Eugene Arkhangelsky.